and you can see pollen dancing in the sunbeam that warms the cat. I plant things, and wonder how to do it more effectively. It is all mysterious to me - even from long lines of gardeners and farmers on both sides of my family. I like that things grow. I want to help them along... but I get distracted. I wander the yard in no real pattern. Probably in dress clothes from a rare outing outside the house. I pull things up and then remember I own gloves and I should wear them. I yank at other things and remember I have a tool for that. I go to get the tool and see that the garage is a mess. I tackle the clutter, put the tools down on the cedar chest I really must move out of the garage and go inside to change. Whereupon I see laundry. And fold it. Patrick commented yesterday on the grass. "It's so pretty, Momma! I love it! We have the only grass with little tiny flowers!" Today we mowed, in response. I tried to explain to him how we distinguish weeds from desirable plants and it made no sense to him. The deeper I dove into the topic, the more it felt fascist - pulling up dandelions and clover and pretty little white flowering things with no known name. I couldn't explain myself. When we walk to school this time of year, my favorite yards are the yards at the edges of our neighborhood. They have thousands of matured, multiplying daffodils - but also the plants of my youth. 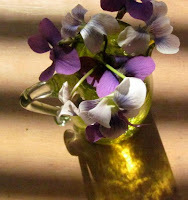 Memories emerge of lazy spring days making "salad" of dandelion leaves, violets, sour clovers, and chives. I don't recall if we ever ate the salads, but my older sister spent one spring obsessively making violet jelly from Yule Gibbons' book. She was 11 or 12 and already achieving things that never occurred to the rest of us. Most of the yard owners manicure all that away. They trim out the magic, leave the expected - tidy and trim. Colors in controlled bursts. Flowers you are most certainly not meant to eat. The children burst out of the house with this weather - God's weather. The sun is bright, but the air is never oppressive. People emerge to drink on their porches in the evenings, to walk the neighborhood - to generously imagine everyone is a friend. Annabeth turns 8 next month. Something close to 1/6th my age - though it feels, in some ways, that I have known her forever. I have known her for her forever - a world where she imagines she can remember when she was "little." Spring is the right time for her, sunshine and optimism on her better days. She received an award this week. Arts Laureate, representing the first grade in the arts assembly. She was so proud to wear the dress her grandmother made, so proud to receive an award for what is certainly the Most Important Thing. She sees patterns everywhere, comments on the color of weathered buildings. We see the artist's temperament at times, but we saw something so proud, so grown-up when she strode across the stage wearing her medal - the tallest child until the fifth grader at the end. I turn 42 tomorrow. A weird number. It sounds sensible, established. Far more of either of those things than I am - with my charmingly weedy yard and children flung across the neighborhood. But twice 21, and certainly twice as smart as I was at that number. Which is something. And... it is spring. This will be a good year.